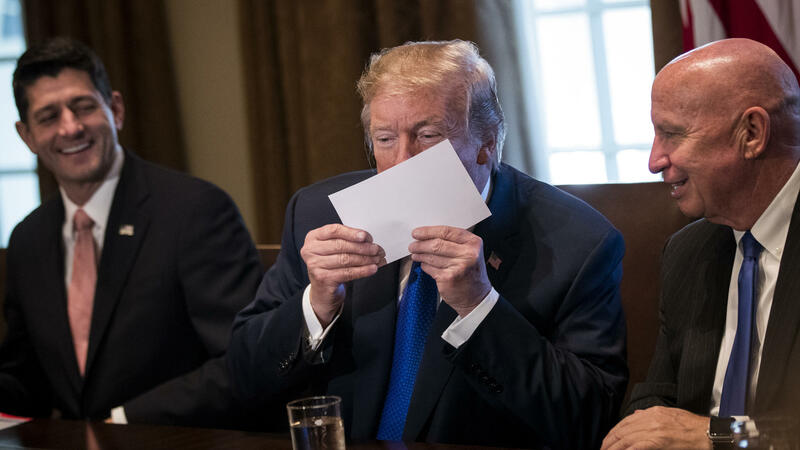 President Trump kisses a mock-up of a 1040 "postcard" during a meeting with GOP congressional leaders. 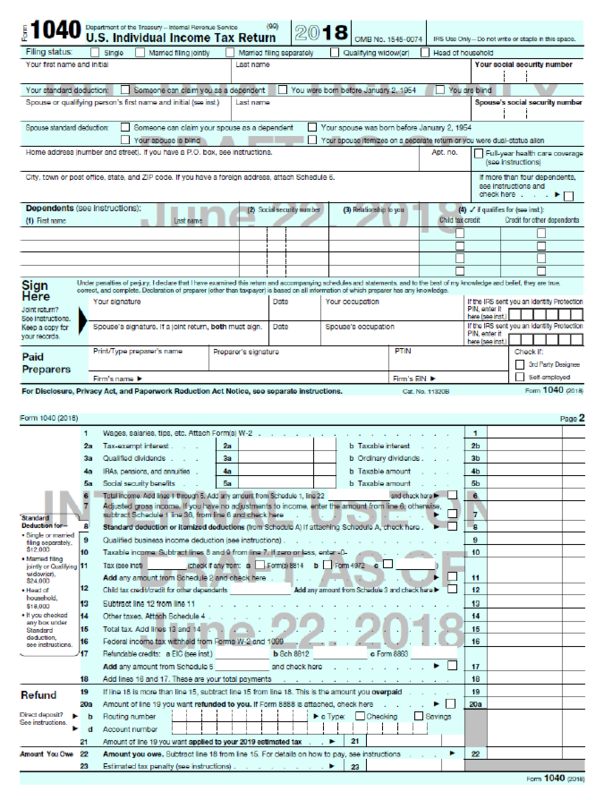 A draft of the new 1040 tax document, obtained by NPR, that the Trump administration says fits on a "postcard." The IRS is planning to unveil a new tax return form — as soon as Friday — that is the size of a large postcard. It's been touted as a way to simplify tax filing and is something President Trump pushed congressional Republicans to come up with. Treasury Secretary Steven Mnuchin said the document "will be a postcard, as we've promised, and hard-working taxpayers won't have to spend as much time filling out their taxes." Sounds good, right? Imagine, filing your taxes on a postcard. What could be easier? But a look at a draft version of the form, obtained by NPR, show things aren't quite so simple. For one thing, it's a rather large two-sided document, about the size of half a sheet of paper. It does have fewer lines, 23. The current 1040 form has 79. But people will still be required to file several pages of worksheets if they wish to itemize deductions. And, unlike an actual postcard, this one will have to be put in an envelope to be mailed — unless you want your Social Security number and private financial information on full display. Howard Gleckman, a senior fellow at the Tax Policy Center, a Washington think tank, says the whole concept of a written tax form postcard is kind of irrelevant these days. After all, who uses paper anymore to file their taxes? 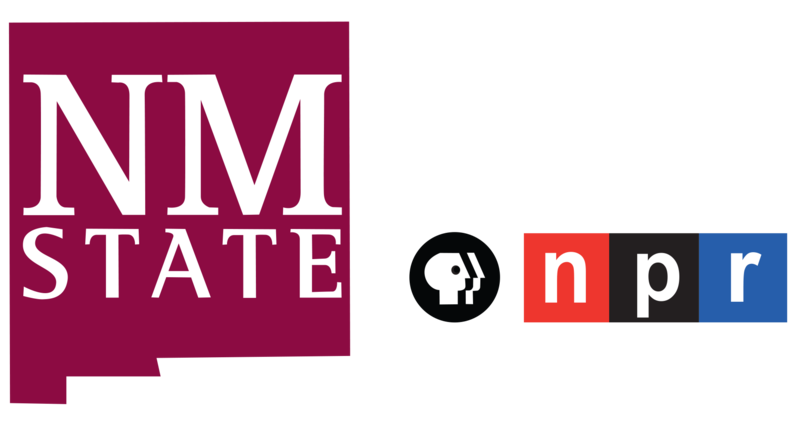 "More than 90 percent of us file our tax returns electronically," Gleckman noted, "and I suspect if you ask most 30 year-olds about postcards they won't even know what you're talking about. "So it's kind of a silly 1950s concept that makes for a good photo op, but it doesn't really change people's lives." Trump and congressional Republicans promised to slim down the size of the 1040 form to postcard size when they first talked about their tax cut bill. The president even kissed a mock-up during a White House appearance. Gleckman did point out that the new tax law Congress approved will make it easier for some filers, as it "significantly increases the size of the standard deduction." That will simplify tax filing for millions of people, and "that's a good thing in terms of simplicity," he said. But, he added, changing the form for everyone else "is a PR stunt and really has no effect on their lives." Except maybe to complicate them actually. For instance, if you receive alimony or can claim deductions for teachers' expenses or are claiming energy credits, you'll need to use one of six new worksheets. Some entries, once on the tax form itself, are now on separate worksheets, which means they could be overlooked by some taxpayers. And some lines on the new form, such as the one for people wishing to claim the earned income tax credit, are harder to find. Because those worksheets and the new "postcard" itself will all have to be stuffed into an envelope, as Gleckman points out, you probably won't even save on postage.